Hi friends! Welcome to another week! I've really been missing Mojo Monday lately, so I thought I'd bust out a sketch and see if anyone wants to play along with me? I probably can't do it every week, but maybe every other week. Yay or nay? Let me know in the comments. The sketch for today is down below. I'd love to see what you create with it. Here's the card that inspired the sketch I'm posting today. I just recently picked up the Georgia Blues paper pad from Prima and couldn't wait to break it open. Hubby and I were married a few days before Christmas many moons ago and our colors were navy and silver. So this collection immediately made me think of creating an anniversary card for hubby. Love those deep blues! I pulled out the Merry & Bright Messages stamp set and the Ornament Tag Fancy Dies from Hero Arts and set to work on my shabby creation. I die cut the shape from patterned paper and adhered to an ornament die cut from chipboard to give it a bit more heft. 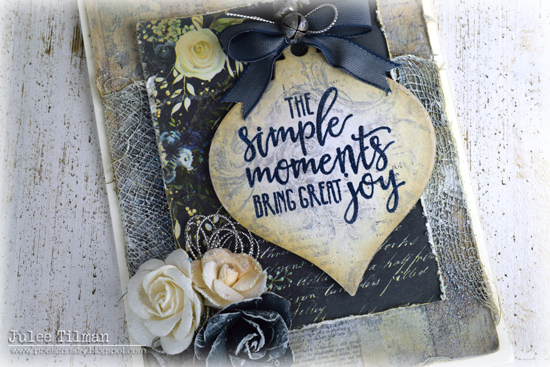 I next embossed the sentiment in navy ink with clear embossing powder. I just love this sweet sentiment and thought it would be perfect for our anniversary. All of the paper panels are sponged with antique linen and gathered twigs distress oxide ink. For a bit of texture, wrapped some cheesecloth around the background panel of patterned paper, then sprayed with a bit of Ahoy Matey Coloringz spray. When it was dry, I dry brushed on some gesso to give it a frosty feel. For the corner embellishment, I added a random mix of recollections paper flowers and some tiny bells with loops of silver cording. I then embellished the top of the ornament with a bit of taffeta ribbon and some jingle bells. Finished off with a bit of dry brushed gesso on the bells and flowers, as well as some distressed edges on my paper panels. While I was at it, I decided to make a little coordinating ornament for Mark's stocking. 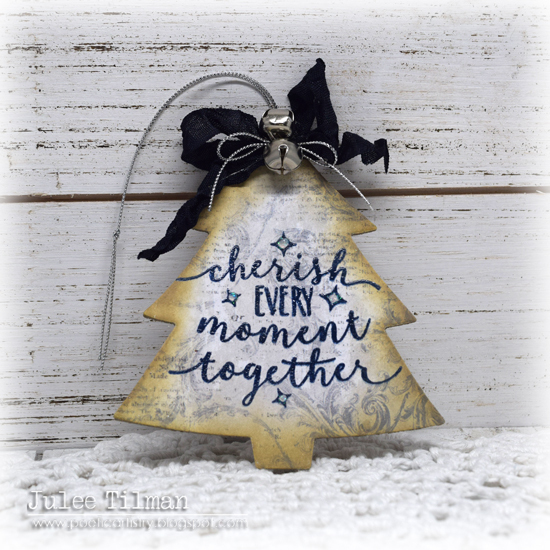 This time I used the same sentiment set and the Tree Tags Fancy Dies. I backed it with chipboard and did a similar ribbon/jingle bell embellishment to the top. Super quick and easy and I'm excited to see it on our tree this year! Yeah for sketches! I have not had time to do many cards lately, but, when I do, I look for a sketch to begin...and I welcome another option - especially Mojo Monday! I miss MOJO Monday too. Love the sketch and will happily play along. Love your gorgeous card and the pretty papers. I think the sentiment is perfect for an anniversary card. TFS. Thanks JoAnn! Can't wait to see what you create! I'd love to play along! By weekly or monthly would be great! I've missed Mojo Monday soooo much Julee, it would be fabulous to have you continue it on a low key basis, when it suits your schedule! Yay!! Bi weekly is great :o) Welcome back, Mojo! I have been missing your sketches and wondering how life is going. I am so happy to see you back. I love to play and it is great to see another of your wonderful sketches, Julee. Your vintage looking card is beautiful. Gorgeous cards, Julee. I love your sketches and will most definitely be playing along with you. I would love to see more Mojo Monday sketches. Even if it's only once a month. Do what feels right to you. I'm so grateful for talented sketches designers like yourself that always provide me with card inspiration. Have a beautiful day! I have missed Mojo Monday and it would be fabulous to have you start it up again, and for two weeks would be perfect, as my time is so limited these days! Your card and ornament are gorgeous! Of course you always make the most beautiful vintage cards! Gorgeous card as always! Love the layers! Fingers crossed that Mojo Monday can make a come back! I totally get the time commitment though. I think semi monthly or monthly would work great! This made me so happy to see! I love your sketches and would love to see them return, even if it's only once a month!! Yay! Beautiful vintage Christmas card Julee. Great sketch. Beautiful card!! I agree with the others, I would love to see those sketches brought back!!! Beautiful card. Love the idea of Mojo Monday coming back. I’m definitely playing along! Wonderful card and gift for your hubby. Mojo Mondays visiting would be great when you can do so. I have missed the MojoMonday sketches, I used them a lot. I will definitely play along. YEs, yes, yes, a sketch whenever you can would be awesome! Love the sketch and the card!!! Your card is so beautiful! I love the texture and dimension! Wonderful Anniversary card! I just had to play along with the Mojo Sketch, too! Yay, I've missed Mojo Monday! It was one of the few things to look forward to on Monday's ;) I love the idea of every other week, maybe you'll keep the linky open longer? Hope to play along soon! Your card and tree are STUNNING. I'm so happy to see your sketches are back as I think over the years I used more of your than anyone's and I NEED a sketch. Thank you so much. I wouldn't even mind one once a month? YES, Oh YES! Loved your sketches would love to see these come back. Any timing that works bestest for you, works for us! :) Thanks Julee! YOU ROCK! Oh, yes, please! I have been missing the Mojo Monday sketches so much! I'm getting ready for a short trip, so no time to make a card now, but I am looking forward to more sketches whenever you can find the time! Thank you! Your card is gorgeous, Julie! So looking forward to Mojo Sketches again! Just realized that you're BACK!!!!! So glad to see your cards and sketches again.... no matter when!